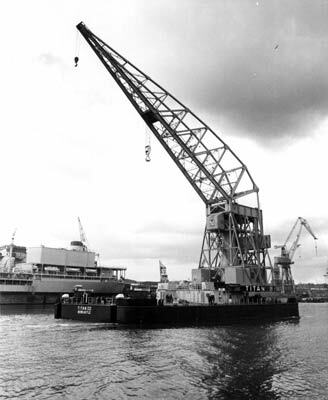 Michael McFadyen's Scuba Diving - Titan Crane In late 1992, in one of the more stupider acts against Australian cultural heritage by a Government, the NSW and Australian Governments permitted the giant floating crane, Titan, to depart Sydney Harbour for Singapore. 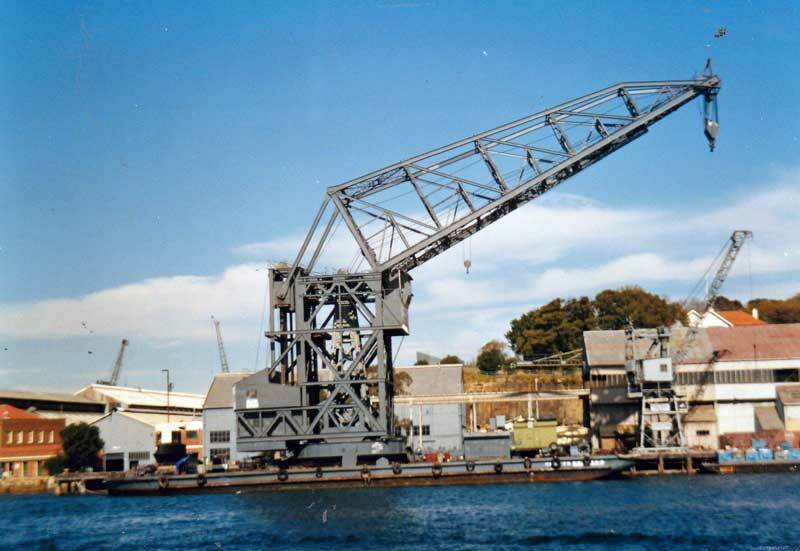 The Titan crane was built in England and assembled at Cokatoo Island Dockyard in Sydney Harbour in 1918-19 and had spent the past almost 75 years working the Harbour. It was used in the construction and refitting of vessels at the dockyard, particularly during World War II, and also in the construction of bridges in Sydney Harbour and power station machinery. The crane was 58 metres high and able to lift 150 tons at a 27 metre radius and 100 tons at a 38 metre radius. The hull of the crane was 176' 10" long and 79' 8" wide and displaced 2,125 tons. The crane was not self-propelling and required two or three tugs to move around the Harbour. There were two steam engines driving generators (220kw) which provided the power for winches etc. A coal fired boiler 11 feet in diameter and almost 10 feet long heated the water to create steam. On 16 July 1934, the Titan unloaded a Lockheed Altair aircraft (rego VH-USB) from the freighter SS Mariposa. This plane was to be known as the Lady Southern Cross and was owned by Sir Charles Kingsford Smith. This place was was to be used by him in a number of record breaking flights. Kingsford Smith set records for Melbourne to Sydney, Melbourne to Perth, Perth to Adelaide, Adelaide to Sydney, Sydney to Brisbane and Brisbane to Sydney. Smithy flew the plane to the US and on to London. On a flight to Sydney, the plane crashed into the sea off Burma in November 1935. The plane has never been found. 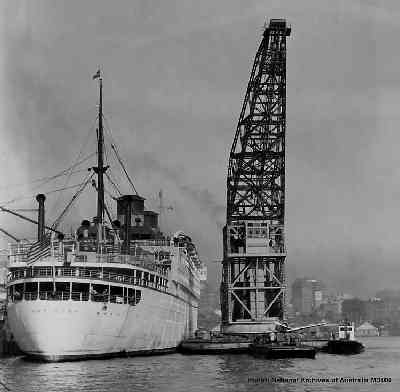 Also in 1934, the Titan lifted a 30 ton mast formerly on HMAS Sydney into place on Bradleys Head. During World War II, the Titan was used 24 hours a day, 7 days a week loading and unloading warships and cargo ships. During the construction of the Iron Cove, Spit Bridge and Gladesville Bridges the crane was also used. I still have not researched the majority of years of the crane's life but the final owner was Cockatoo Island Dockyard. In 1976 the Titan was retired from normal work, although many times during the late 1970s and early 1980s when I worked in a building overlooking Darling Harbour, I would see the mighty crane, moved by a tug, come alongside a 50,000 tonne freighter. With great skill, the Titan would delicately lift a large power or sail boat off the deck and gently place it in the water. Sometimes even more interesting things would be taken off and placed on the wharf, including once a Sikorsky S61 helicopter bound for the Queensland island resorts. Despite what I saw, apparently she was no longer in fulltime use and only brought into work when the conditions dictated. For example, on 24 January 1984 the Titan lifted the ferry Karrabee to the surface after she sank at Circular Quay at the end of the Great Ferry Race. In 1985 she lifted the three sections of the two Japanese midget submarines that were sunk in Sydney Harbour in World War II off a wharf, onto her deck and then transported them to Cockatoo Island where they were restored before being sent back to the Australian War Memorial in Canberra. In 1985 she also lifted the old timber Sydney ferry Kanangra from the water onto the island. In 1989 the Titan lifted the famous British steam locomotive the "Flying Scotsman" onto a ship for her return to England. The train had been in Australia for a Bicentennial event where it was on active duty with her Australian conterpart, 3810. Apparently the same year the Cockatoo Island Dockyard surveyors decided to only survey the Titan for three months instead of the normal 12 months. It is alleged that this was because the were concerned about the condition of the hull plating but I am not certain about this, it may just have been that the dockyard did not want or need the Titan to be surveyed for the whole year (eg save money or defer major repairs). In 1990 the Titan was classified as an example of early 20th century heavy industrial structures by the National Trust. Around this time the decision was made by the Federal Government to close Cockatoo Island Dockyard. The Titan was put up for sale and she was purchased by McKenzie Salvage Corporation of New Zealand for $25,000. There was an uproar over this and to make matters worse, McKenzie sold the Titan to Wirana, a Singapore company. As part of the sale, the steam engines and generators were removed and kept for later display. They are now in the Industrial Precinct on Cockatoo Island. Wirana applied for an export permit under the Protection of Movable Cultural Heritage Act 1986 (since the crane had been classified by the National Trust) and a "temporary" export permit was approved. A condition of this was that the Titan had to be returned to Sydney by July 1995. It is also stated by Jack Clark (see references) that the move from Australia to Singapore was only temporary to offload burnt containers from a ship called Ocean Blessing and to assist the salvage of a Russian naval vessel stranded in India. The crane was to come home to Sydney in June 1993. However, I do not recall any such information being published at that time that supports such a claim, but it may be correct. Therefore, for reasons that now seem unfathomable, the Titan was sold overseas. The outcry over this action was huge. People attacked the loss of this unique piece of Sydney's heritage and mariners stated that it was impossible to safely tow the crane to Singapore. Most of this concern appears to have been based on the top-heavy design of the crane rather than the condition of the hull itself. A committee of independent experts inspected the crane and stated that they had reservations about the ability of the Titan to be towed to Singapore. Despite this, they did not find any reasons to prohibit export. Eventually, on 22 or 23 December 1992 the Titan left Sydney Harbour bound for its new home of Singapore under the tow of the ex-New Zealand Government fisheries research vessel Rapuhia. It was towed stern first. The hull of the crane had allegedly been sealed (however there are now holes to enter the hull so this seems not to be true) and the crane placed in its lowest position to lower the centre of gravity. The weather was strong northerly winds (up to 20 knots) and a strong current from the north of around five knots. On Christmas Day the winds were up to 26 knots and seas up to two metres. That night at 10:50 pm, disaster struck the Titan as forecast by all the experts (except those paid for their advice by the new owners). It is stated that at that time the towline jerked and towline parted. It is also said that the crew discovered that the Titan had capsized. However, news reports at the time indicated that it was not until morning that the crew of the Rapuhia saw that something was wrong. That was a giant understatement! The crane was now upside down and all that could be seen at the end of the towline was the hull of the Titan. News reports at the time indicated that it had turned turtle sometime during the night off the coast near Smoky Cape, South West Rocks (near Kempsey). Imagine, the crew had not even noticed what had occurred to the crane except to think that there had been a bit of a current during the night slowing them down. The Titan was towed south and into shallower water and after consideration (advice from commercial divers and others), it was decided to drop the Titan in 40 metres off Perpendicular Point at North Haven, just south of Port Macquarie. This was at 9 pm on 27 December 1992 after divers had inspected the crane and discovered that the top section of the crane was not longer there (it fell off at Smoky Cape). There was an investigation by the Maritime Incident Investigation Unit of the Commonwealth Transport and Communication Department under Captain Kit Filor. He found that the Rapuhia was not registered, in fact her papers stating that it was registered in Honduras were forged. In addition, the Mate and Chief Engineer also had false papers. 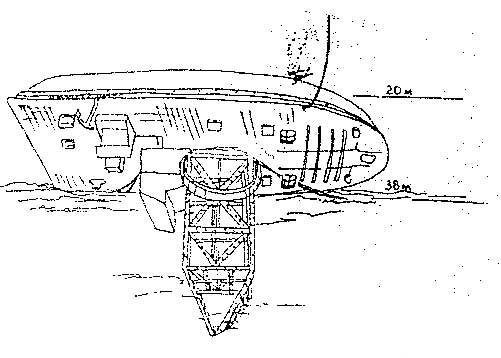 However, he could not find an exact reason why the Titan capsized but he theorised that rivets had failed and water entered through hull plates. Further, he stated that the high centre of gravity of the crane jib may have caused or at least contributed to the the tragic loss. However, I am certain that it was the high centre of gravity and the large seas that caused the Titan to tip over. In early 1993, Paul Doney, former owner of Sydney's Pioneer Diving (now Pacific Coast Diving Clovelly) was hired to do some work on the wreck to make it safer for divers. In February 1993 he invited Jim Glass up to dive the wreck and Jim wrote an article for DIVE Log which was published in the March 1993 issue. Jim also prepared a drawing of the Titan as he saw it. The Titan is now located 31.8 kilometres south of Port Macquarie (by boat) and 3.4 kilometres south-east of Telegraph Point at Camden Haven. It is located at GPS Reading 31º 39' 57.1"S 152º 52' 20.1" E using AUS66 as datum. See my GPS page from left menu for more information. I had attempted to dive the Titan since Easter 1993 but the weather conditions had defeated me time after time. Finally, in September 1995 I had the chance to dive the Titan with a Sydney dive club of which I am a member. The then dive operator (he has now gone out of business) pointed out that this is a dive for divers certified as "advanced divers" and would only take persons certified as such. On the first day of our dive weekend, we arrived over the site and anchored. There was a current of about 1.5 knots but I had no real problem swimming against it to the anchor line. However, the trip down the line was a problem. The current continued all the way to 40 metres and I used 50 bar of air during my trip down, primarily because I was carrying a video camera and could not assist my descent by pulling myself down. I also took four minutes to reach the hull compared to one and a half minutes normally. My air consumption during this part of the dive reached 33.4 litres per minute (surface rate) as measured by my Aladin Air X dive computer. Compare this to my normal rate of 13 to 14 litres/minute. Once reaching the wreck I found myself still in the current so I dropped down a bit on the hull where I rested till the others arrived. Straight away I realised that the wreck was very different to that shown in Jim Glass's diagram. The shallowest part of the wreck is now just over 30 metres, compared to 20 metres in February 1993. My breathing rate stabilised after a minute or two and I dropped off the hull (after another hard swim) to the sand bottom. I soon saw why there was a difference. The superstructure of the Titan (the crane base) has sunk into the sand so that the wreck is now almost totally upside down. The depth of almost 40 metres means you only have about 11 or 12 minutes (using Aladin computers) before entering decompression diving. I soon encountered more trouble when I moved under the wreck to get footage of my buddies. I put my hand on the sand to stabilise myself and was hit by a electric shock from a hidden numbray. My hand and arm started to hurt and I wondered whether my Air X might have been affected (it was not). More care is needed, I thought, as one buddy disturbed yet another numbray. Finally, I get to see the wreck. The deck has bollards, a cabin of some sort and the giant circulating crane base. We swam under nearly half of the deck before deciding to surface a little early due to the current. It had not decreased and I used even more air while ascending (33 litres/minute) and it was very difficult to hold on to the line while holding a heavy camera. I decide against trying the deco bars for a number of reasons. As I return to the ladder, I see the bars at 45 degrees without anyone even touching them. As we get aboard, we all agree that it has not been a pleasant dive but due to the experience of the divers in our group, we have not encountered any real problems. Later that day, more members of the group dive the Titan and the current is even stronger than in the morning, probably just over two knots. These divers collectively are even more experienced than the morning group so they survive. The next morning we do the Titan again (we are persistent if nothing else) and find the current about the same as my first dive. I did not take my camera and found it considerably easier. We swim around the entire deck area and look inside some of the hatches (thus disproving the claim that the hull had been sealed before leaving Sydney). We also found that it was dangerous to get too close to the end of the hull as the current could easily sweep us away from the wreck into the murky water. Well, what are my thoughts now as I write this article? Firstly, I am dismayed at the stupidity that permitted the Titan to leave Sydney Harbour. Secondly, it is a now very good dive site that could provide a number of enjoyable dives to experienced (rather than "advanced") divers who have done some deeper diving in similar waters. Thirdly, even experienced deep divers must take great care due to the almost constant current present on the wreck (everyone I know who has dived it has encountered strong currents). However, for reasons I cannot go into here, I stated in 1995 that I would not recommend this dive to anyone. Why? Read my thoughts on the reasons. The local dive shop I mentioned above is no longer operating. As far as I know, there is no dive operation now in this area. There is an almost identical crane working on the River Tyne in Newcastle, England. This is called Titan III but used to be called Titan II. It is different in that the pontoon is self-powered whereas the Sydney Titan was moved by tugs. The pontoon of Titan II was changed from a non-powered to powered pontoon in about 1975. AFLOAT.com.au (a monthly magazine), February 2000 issue, page 11 to 13, article by Jack Clark. See their web site but I am not sure if this information is there.